In just a few hours there will be a pre-release party, just one of several events launching the Life Before The Lottery: Living Beyond The Bucket book into the realm of public view. Eight months after the initial Kickstart, the words are written and the printing press finally finished, yet the real work is far from over. But for now, today, it’s time to curl my hair, put on some cute shoes, and raise one of many toasts in celebration to those who have pulled and cheered for this project. I am humbled, grateful, and a little embarrassed by all the support. This is amazing. The Amazon pre-order link posted slightly earlier than originally anticipated (thanks Amazon robots), leading to a “temporarily out of stock” situation just days before the planned release happening September 22, this Monday. On one hand, I can freak out. On the other hand, it’s actually worth a smile. This book is full of failure stories. Maybe a highly inconvenient time to be “out of stock,” but completely worth a giggle because I could be battling an entirely different problem…a book no one wants to read sitting in a warehouse somewhere in Indiana. No matter what Amazon does or does not have at any given moment, I have several opportunities over the next two weeks to hug real live souls who have been pulling for this, rooting for this, or are even just plain curious. And for that, I am extremely grateful. It takes a village to publish a book (thank you to the teams of people, brilliant minds, and talented individuals involved in this!) It takes even more to fight fears, distractions, disappointments, self-doubts and naysayers. But we’re here. We made it. It’s happening. I was told to go get it, and it’s officially been “got.” Thank you Lord! So cheers to book launches and all that goes with it! It’s officially happening! The “Life Before The Lottery: Living Beyond The Bucket” book is ready to go…and now it’s time to launch this thing. For those not able to attend one of the three launch events in Colorado (listed below), you have options! (Kickstarter backers who participated in a package that included book perks can pick up their “thank you goodies” at one of the events. Or for our out-of-stater supporters, fill out the upcoming form coming to your inbox so we know where to send your goods!) This has been an amazing experience, thank you for being a part of this. Thank you, I stand amazed. You are a pursuer. The Declaration of Independence recognizes and declares the fact that we were endowed by our Creator for the pursuit of happiness. But what exactly is that? 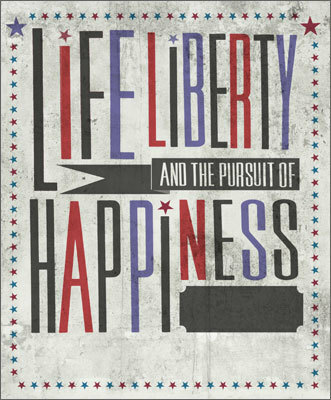 In pursuit of happiness, what are you pursuing? There’s a lot of things in this world to pursue. Not everything can be caught. (Nor should it.) Every day when we wake up, we are going after something. What is your something? Is it more money? A promotion at work? A bigger house? New car? Better education? Something for the kids? A better bod? Healthier bank account? Better relationships? A new relationship? That cute girl? That amazing guy? Peace? A dream? Are you pursuing something that's worth pursuing? In pursuing the publication of this upcoming 30×30 book that’s now just weeks away from launching, I was asked that very question. What exactly am I pursuing and what does success look like to me in the book world? I had a really tough time answering that. It’s almost easier to tell what I’m not pursuing or not wanting than what I do. Sometimes it’s easier to identify what’s not right or not working than what is. I do not want a ton of books sitting in a warehouse somewhere. I do not want to be the lonely author twiddling her thumbs at scheduled upcoming book signings because no one showed up or no one cared. I do not want to bug and bother friends and family and be a burden in this whole process in any way. I do not want to find a bunch of errors in the final edition after the major print run (although I’ve been told errors will surface no matter what or regardless of how many editor eyes have been through it. *sigh*) I do not want to be axed out of Amazon for a bad book. I really don’t want a chain of bad reviews. I do not want to be seen as arrogant, come off as vain, or become full of myself because of any type of success or self-promotion that’s required to do this. Yuck. I do not want the Kickstarter backers and supporters of this project to be disappointed in any way. I do not want to fail. Huh. That was easy to define. Even if every single one of the things mentioned above happened, I know in my heart of hearts this book was worth it. Had to be done. As with a lot of other things in life, it’s so easy to label and identify what I don’t want. But the question still lingers, what does success look like to me on this and what am I doing to pursue it? Because at the end of the day, if I don’t know what I’m pursuing, how will I know when I actually get it? Is it a dollar amount that will be the signal of success? Is it a number of copies distributed? Is it getting on any certain best seller lists? Is it positive reviews or feedback from the readers? Is it a lead in for the next book? Is it being recognized publicly or attributed some type of “fame?” The answer to these for the moment, at least for me, is no. That is not in my pursuit of happiness. ...for the moment the immediate goal is to somehow get it out there and trust it will get into the right hands at the right moment, hitting the right hearts and producing the right results. I’m also looking forward to seeing what type of change this brings to my own world. Writing this book unleashed a new list, new dreams, new desires, and a new beginning. Incredible sacrifices were made in pursuit of the 30×30 book dream. More than I ever care to admit. Something important hinges on this book and I can’t wait to find out what it is and what’s on the way. On that particular note, I really don’t know exactly what’s on the way or what I’m to pursue next…but I’m in motion and excited to go get it, whatever “it” is. So cheers to change, book launches, the pursuit of something that’s worth pursuing and all that goes with it! Go ahead, pursue something that’s worth pursuing.